(Dec 18): Private home sales in Singapore more than doubled in November from October as developers marketed more projects. Home builders in the city-state sold 1,198 units last month versus 487 apartments in October, the Urban Redevelopment Authority said Monday. 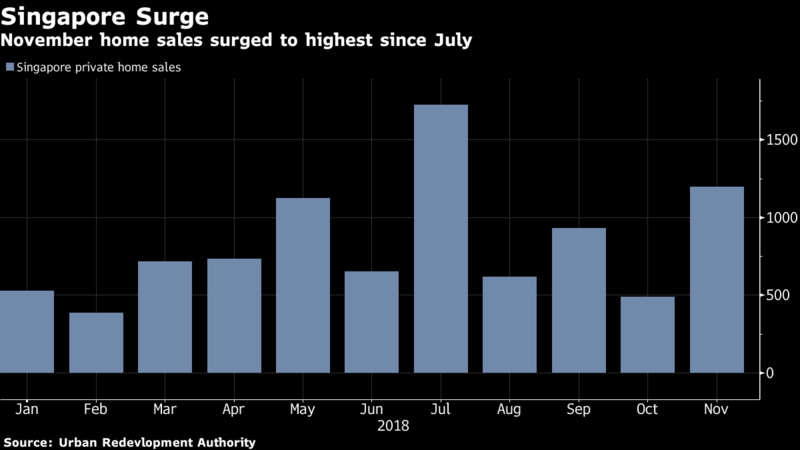 Home sales rose to the highest since July. One of the main reasons for the advance is as simple as home builders bringing more new projects to market. They included condos with pools, leisure areas and landscape gardens such as Kent Ridge Hill Residences, Parc Esta, Whistler Grand and Belgravia Green. The year is likely to end with sales of 9,300 to 9,500 private new homes, according to broker PropNex, around 10 percent lower than 2017’s tally of 10,566 units. That shows measures to cool the market are ultimately having their desired effect.